Tis' the season to be jolly! R&R will fill up Dan Wolfgram's van with toys to be donated to Toys for Tots per the number of fans we have on Facebook. Dan has been gracious enough to volunteer his van for this use. Dan is the Vice President of Personal Lines. 500 fans = Front seat is filled up - DONE! Toys will come from R&R and from employees, but donations are welcome! 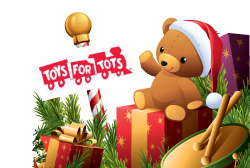 You can drop off toys at any of our 4 locations - Waukesha, West Bend, Menomonee Falls, & Beaver Dam! Photos will be taken periodically and updated on our Facebook page to show the progress! Help us reach our goal by liking our Facebook page (and share it with your friends)! Be sure to check our page to see how the van is filling up!